Now that I'm at an age (read: a Grown Up) for sending and receiving Holiday Cards, I always feel guilty throwing the card in the trash. I normally display them on the ledge over the sink then finally stick them in a drawer to never been seen again - I do this with wedding invitations, too. As a past bride, I know how much time and money goes into designing these mini works of paper art, and I can't reason with myself to throw them away. However, I like to keep the front of my fridge bare and neat, and the side is already taken over with Save the Dates for next year... so, how's a girl to display her holiday cards? Here are some cute and original DIY ideas for displaying or saving the cards until the holidays are over. If we had a fireplace, I would definitely string our holiday cards across as a makeshift garland, like this picture from ApartmentTherapy.com (above). However, I think I prefer the look of them hanging by clothes pins, similar Martha Stewart shown below. 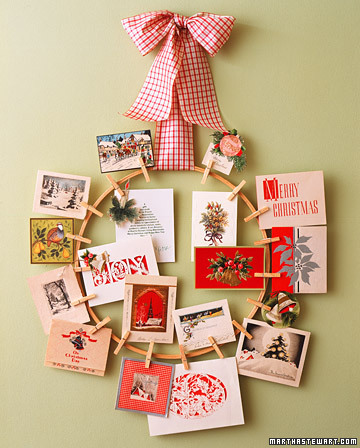 Leave it to Martha, to create a cute DIY Christmas Card Wreath. Here's the instructions on how to make your own, all you need is an embroidery hoop, ribbon, and some clothes pins - easypeasy!